1214 81st Street South, Birmingham, AL 35206. 205.833-8264. 14 miles of trails, ranging in difficulty level from Easy to Difficult, branch and loop throughout the mountain. The trails are open to the public every day from dawn to dusk, but every hiker has an impact, however small, on the trail. That is why we encourage anyone who uses our trails to sign up for membership, or give $3 if you are not already a Ruffner member. Visit our Support page to learn more. Student groups from pre-K to the undergraduate level regularly use the trails for science research projects to learn more about the natural world, and many organizations and local hiking groups enjoy our trails on a regular basis. Would your group like to visit Ruffner? If so, you may contact us at info@ruffnermountain.org, or call (205) 833-8264. Please stay on the trail and keep clear of cliff edges. Some unusual terrain may be encountered on the mountain and old mining sites are inherently dangerous. Please respect others on the trail, and do not bring any sort of wheeled vehicle onto the mountain. Also, we ask that you respect our limited staff resources and leave our trails as clean as you found them, if not cleaner. Please respect and be kind to Ruffner wildlife and it will return the favor. Leave flowers for others to enjoy, and for your next visit. Ruffner Mountain was mined for iron ore from the late 19th century through the 1950’s. In 1896, a local newspaper reported that its mines produced over 200 tons of raw ore per day for processing at nearby Sloss Furnaces. You may see many remnants of Birmingham’s industrial past while on the trail. Refer to the Preserve Map for the locations of historic Mining Sites. Please help us to preserve this history by leaving these relics just as you found them. The exploration of all mines and caves on Ruffner Mountain is strictly prohibited. If you are leading a class, want to conduct research, or have a special interest in our caves and mines, special permission must be granted by our Conservation Director, Jamie Nobles. Jamie can be reached at jamie@ruffnermountain.org, or 205-833-8264. Click the image above to learn more about the geology of Ruffner Mountain! Tuesday - Saturday, 9:00 a.m. to 4:00 p.m.
Sunday 1:00 p.m. to 4:00 p.m. If Ruffner Mountain is one vast, interconnected web, then the Nature Center is just that, its center. Within its walls you will find the Exhibit Hall, featuring a wide variety of native species, including: “Grady”, the gray rat snake (Pantherophis spiloides), Native freshwater fish, a speckled kingsnake (Lampropeltis nigra Stejneger), a timber rattlesnake (Crotalus horridus), an Eastern box turtle (Terrapene carolina carolina), a copperhead (Agkistrodon contortrix), a red-eared slider (Trachemys scripta elegans), a river cooter (Pseudemys concinna), a yellow-bellied slider (Trachemys scripta scripta), and two common musk turtles (Sternotherus oderatus). In addition to the Exhibit Hall, our Animal Care Department is located at the Nature Center. Here, we care for 25 to 30 animals at any given time. All of our animals are properly permitted, including Federal permits. We care for each animal in our collection, and that means feeding nutritional and carefully formulated diets, including fresh fruit and vegetables for our herbivores and omnivores, maintaining clean habitats and environments, providing enrichment, training, and socializing, implementing innovative exhibit design, regular vet care, minor procedures such as beak trimming, nail trimming, and the administration of vet prescribed medications—all done in-house— and careful records that are kept every day about each animal in our care, including weight and behavior changes. For Mammals: Department of Conservation and Natural Resources. You can also view a list of current, and licensed, wildlife rehabilitators in all parts of Alabama here. For Birds: Alabama Wildlife Center. If you are unsure who to call or need some advice, feel free to give us a call at 205-833-8264. Available March 1st - November 30th, Tuesday - Friday, 9:00 a.m. to 5:00 p.m.
December 1st - February 28th, Tuesday - Friday, 9:00 a.m. to 4:00 p.m. Non Profits: We will work with your budget. We accept one organization a month at a reduced rate, so book early! 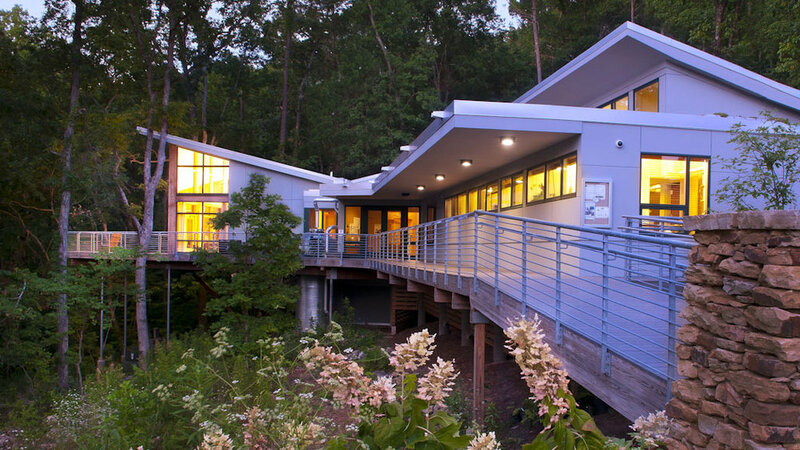 Ruffner Mountain offers an indoor, LEED Certified Nature Center that features a wall of windows with views of the mountainside canopy of Ruffner's woodlands. This space also includes a side porch and can accommodate up to 60 people. In addition to the Nature Center, the outdoor Pavilion can accommodate small groups on a first-come, first-served basis, with advanced notice sent to anne@ruffnermountain.org. Ruffner holds a priority right to use the Pavilion for its own needs and programs. No group other than Ruffner may have exclusive use of the Pavilion as it must remain open to the public at all times. A group cannot utilize the entirety of the Pavilion without advanced permission from Ruffner. The Pavilion is available on a first come, first served basis. If you are interested in holding a small event or meeting at the Pavilion, please email anne@ruffnermountain.org . Note: the Pavilion must always be available to the public. No entity other than Ruffner Mountain can reserve the entire Pavilion for use.